We're all aware that graffiti can be very detrimental to an area often leading to a lack of respect for the local community spaces, like parks and local businesses as well as also increasing the possibility of further incidents of crime; there are also some methods of 'graffiti' that are being used for beneficial purposes. Green graffiti is a new method of street advertising that involves the cleaning of dirt in the shape of a message or template, leaving a clean and clear advertising message underneath. Not only is the message itself important but so is the manner in which the message is portrayed, by cleaning dirt and grime and writing a green message it indicates that clean is green. This method of graffiti advertising is affordable, green and sustainable and does not damage the surfaces it is displayed on; in fact it actually cleans and improves them. And when the message needs to be removed it is just a case of cleaning the surrounding area with a high powered jet washer. Many companies offer graffiti cleaning for incidents of spray paint graffiti that can commonly be seen around industrial and urban areas. This new method of 'graffiti' highlights the benefits of graffiti in portraying a positive message that is easily removed, rather than looking unsightly and negatively affecting the area as traditional graffiti does. Graffiti removal is a growing cost to councils across the UK, with the incidents of graffiti increasing each year as well as a higher recurrence rate of graffiti in the same area over and over. This is why many graffiti and street cleaning companies also offer anti graffiti coatings, a preventative measure that can be put into place once a surface has been cleaned, or prior to any incidents of graffiti, to ensure that in future it is a lot easier to clean, saving man time and also money; whilst also ensuring that local areas look warm and inviting, instead of somewhat threatening and uncared for. 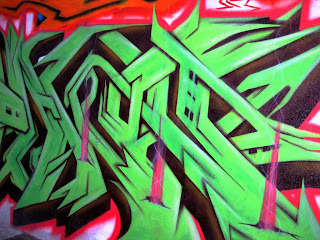 This constant innovation is not only IN the uses of graffiti, such as the green advertising mentioned above and in graffiti as a form of industrial art, but it is also in the methods of removing it or preventing it. Graffiti removal ensures that a clear and concise message is being portrayed to those who vandalise areas with spray paint graffiti. This is helping to make positive steps to reduce the rate of vandalism and graffiti related crimes across the UK, allowing residents and businesses to enjoy their areas and take pride in the appearance of the place where they live or work.